Netcoh Sales carries staples and staplers for roofing, flooring, siding, screens, upholstery, boats, trim, fencing and lattices. We are one of the largest in-stock distributors of staples and staplers in Rhode Island. 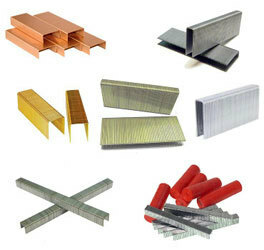 Our inventory of staples (made from a variety of materials) includes galvanized steel and corrosion-resistant stainless steel. We stock a wide variety of staplers, staple guns and power staplers, including cordless and pneumatic power staplers. We sell and service air compressors to power your pneumatic air gun. Let the experts at Netcoh Sales assist you in selecting the best stapler for your project and applications.